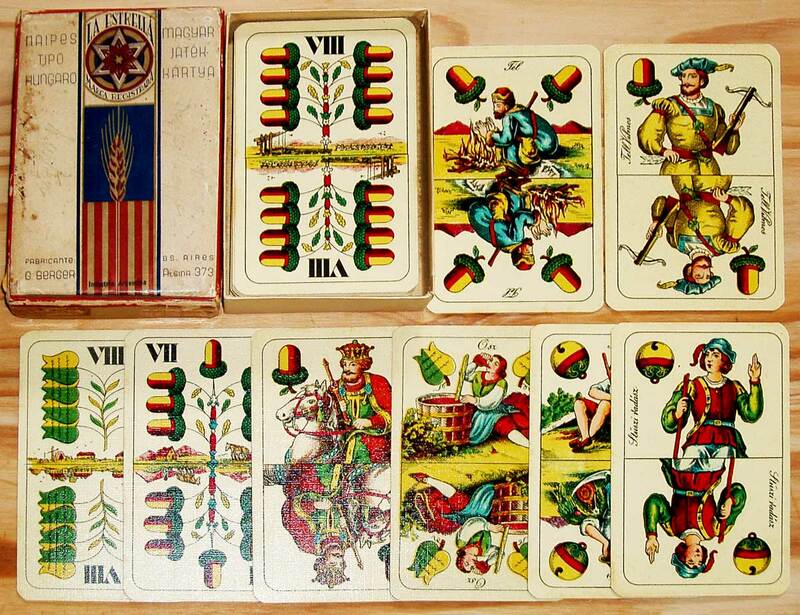 Although primarily associated with Hungary, the deck was also used in Austria, Bohemia and Bosnia. Featuring German suit symbols, the 'Hungarian' or 'Seasons' pattern depicts seasonal scenes on the four Aces. For example, the Ace of Acorns shown below (top row) depicts a man warming his hands, representing winter... and so on. The Kings are mounted on horseback and the over- and under-knaves are usually named and portray medieval Central European heroes. 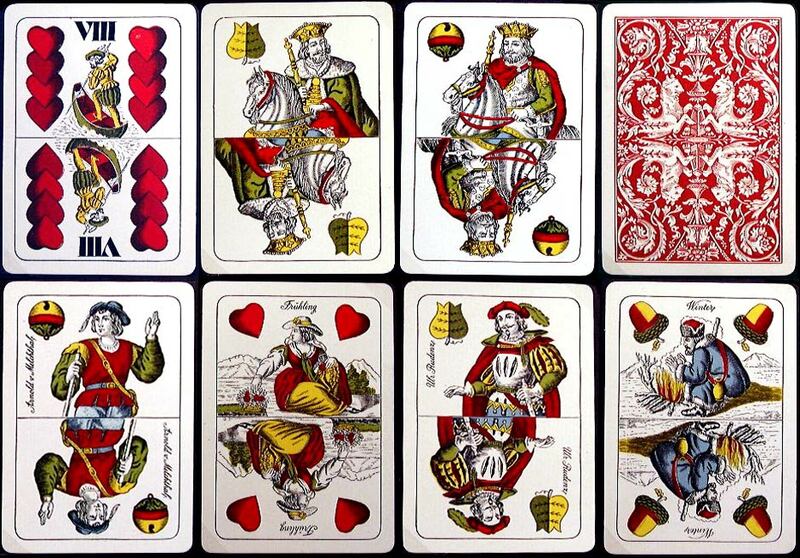 Cards are double-ended and packs contain 24, 32 or 36 cards: typically 7-8-9-10, Lower (Knave or Jack), Upper (Knight or Noble), King, Ace. Above: two early editions of Hungarian 'Seasons' pattern, both are stencil-coloured. Piatnik Nándor és Fiai (Ferdinand Piatnik and Sons) operated in Budapest between 1896-1950. 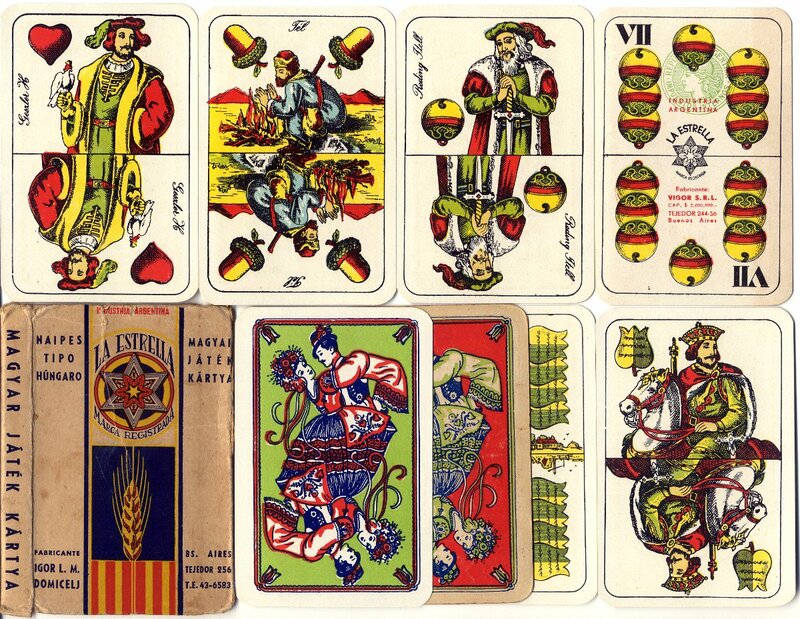 Unio Playing Card Factory (Budapest) was active between 1903-1909 until the firm was take over by Piatnik in 1909. The 30f tax stamp narrows the date to between 1906-1909. Images courtesy Renee Martin. 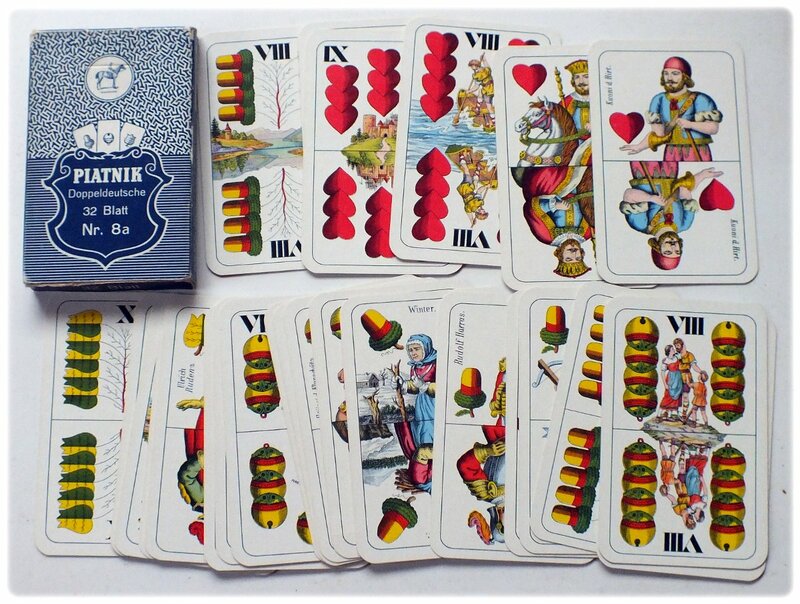 Above: Hungarian 'Seasons' pattern, 32 cards. 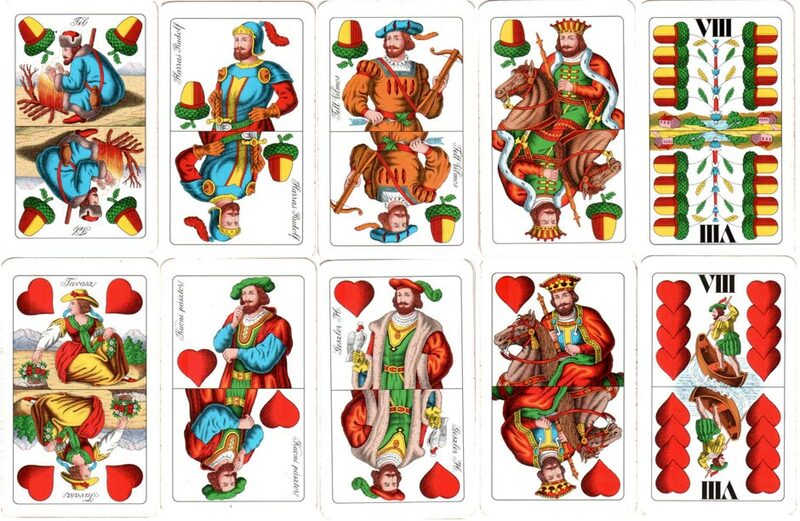 The cards with two pips are always called Aces, not 'Twos' or 'Deuces'. 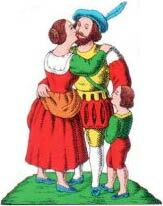 The hierarchy of the cards should run 7-8-9-10, Lower (Knave or Jack), Upper (Knight or Noble), King, Ace. The images representing the four seasons on the Aces also highlight them as the most special in the series. The suits are correctly identified as Nut (acorn), Pumpkin, Red (Hearts or Coeur, French for heart), and Green (or Grape, szölö in Hungarian). In too many references elsewhere, Pumpkins are incorrectly called Bells. 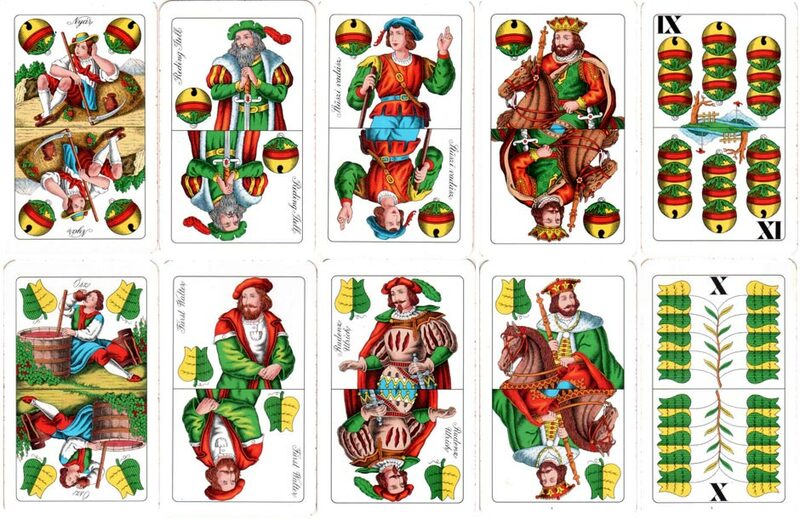 The names shown on the face cards also correspond, as part of the William Tell legend, to the names of characters in Schiller's famous "Wilhelm Tell" epic. The main heroes and villains are all represented, with their names Hungarianized, so that William Tell is shown as Tell Vilmos, for example. Schiller's classic style of writing reminds of Shakespeare's plays. Thanks to Kate Jones for these extra notes. 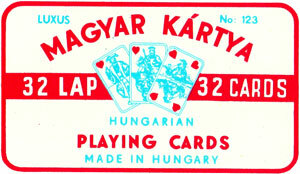 Above: Magyar Kártya Luxus No.123 Hungarian playing cards, c.1970. abbreviation | Hungarian name | English name (in my opininon)"